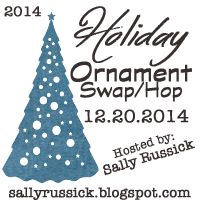 In October I, and many others, received invitations to participate in Sally Russick’s annual Holiday Ornament Swap/Hop. I’d never participated before, but it sounded like fun. Sally said one of the reasons she enjoys hosting the ornament swap each year is that it offers an opportunity to connect with a old bead friends or make new connections. I was given the opportunity to make a new connection with Sandi Volpe. I was certainly familiar with her name in the bead community, but I’d never connected with her. I enjoyed getting to know her a little bit. I’m not sure how Sandi made this. The back of the star is copper. I’m guessing that the front was either made with molten solder or molten pewter. In any case it is really cool looking. Did you notice that there is a crystal embedded on the left side of the star? It twinkles in the lights on the Christmas tree! Sandi’s ornament on our Christmas tree. She also very generously sent along some beady goodness! Of course I love receiving new beadies! 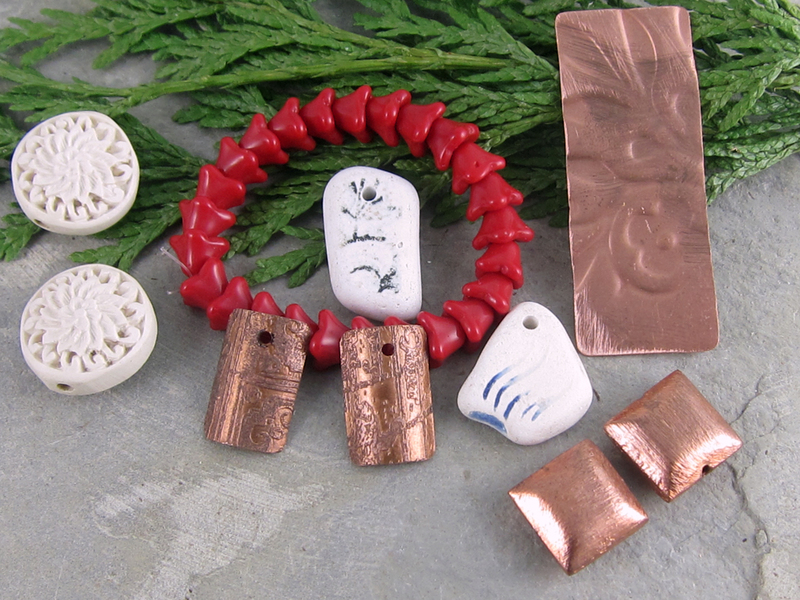 Bead and component gifts from Sandi Volpe. 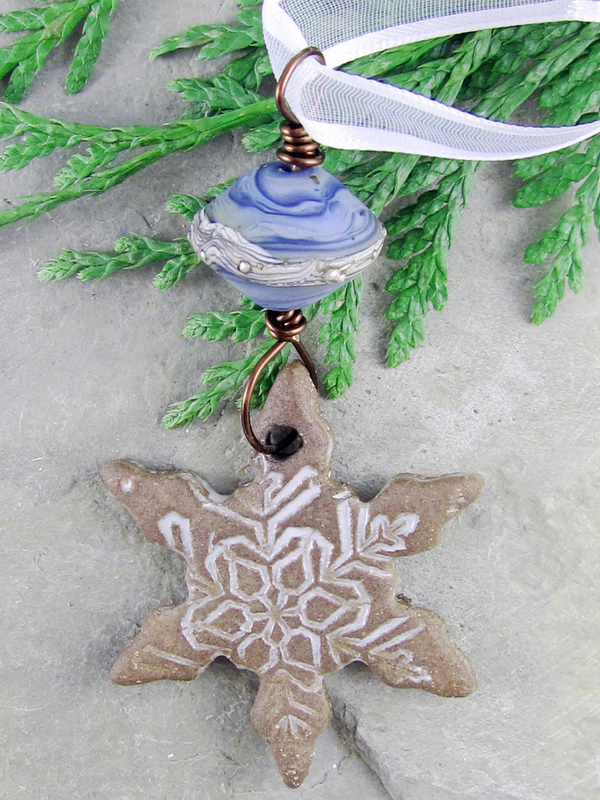 I made a stoneware snowflake ornament for Sandi and topped it with a beautiful lampwork bead by Stone Designs. Did this whet your appetite to see more handmade ornaments? Check out the other blogs links below to see what everyone made! Thank you Sandi for the beautiful ornament and the extra beads! And thank you Sally for hosting the swap and blog hop! Wishing everyone a very Merry Christmas and a New Year that brings you new opportunities and joy. This entry was posted in Jewelry and tagged Christmas, Christmas ornaments, handmade ceramic, Linda Landig Jewelry, ornament, ornament exchenge, Sally Russcik, Sandi Volpe, snowflake, stoneware by Linda Landig. Bookmark the permalink. Two very pretty ornaments Linda…nice work ladies. How did she make that most awesome star???? That is one spectacular ornament!!! Must be one of her awesome lampwork beads, too… Love it! And you certainly received a goody bag to keep you busy, didn’t you?! Love the ornament you made for her! The swirly blues and whites of the lampwork with your snowflake bead are the perfect colors for this season! Gorgeous! Linda, thank you for the beautiful ornament. The star was made by Sharon Palac, left over from bead soup and I am not sure of the lamp work bead. HI SANDI! Sandi is a great swap partner!!! I can attest to that. The star and lamp work are lovely! Linda the glass bead you paired with your clay is a stunner! What a great exchange! Happy Holidays! Linda, you both made and received wonderful ornaments, and they are so similar! I love your new blog format as well! Merry Christmas! So beautiful Linda – your stoneware is really amazing! 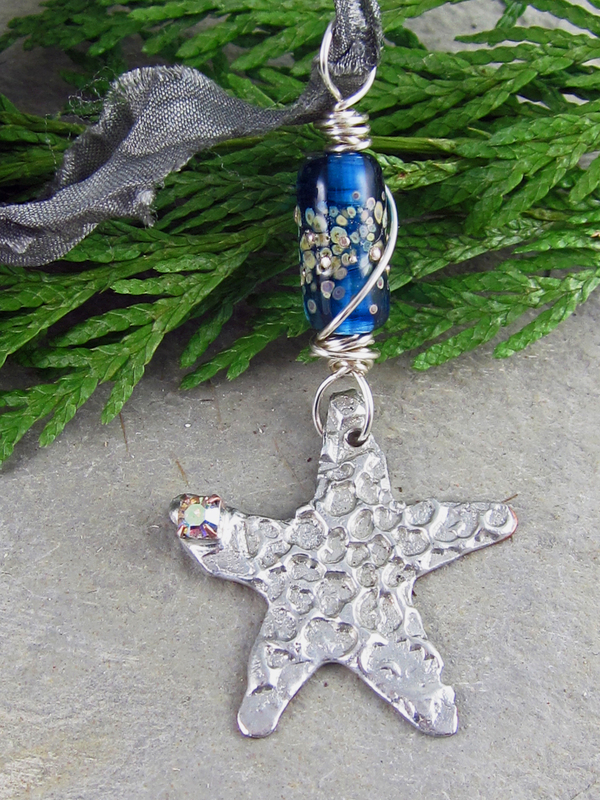 Hi Linda, the lampworked bead on Sandy’s ornament is lovely and it pairs so well with the silver star. True beauty. The ornament your created for her is beautiful as well. The lampworked bead is a perfect compliment to your lovely snowflake. Great job. Linda, I love the snowflake ornament. Your ceramic skills have really shined through and you picked the perfect lampwork bead to pair it with! 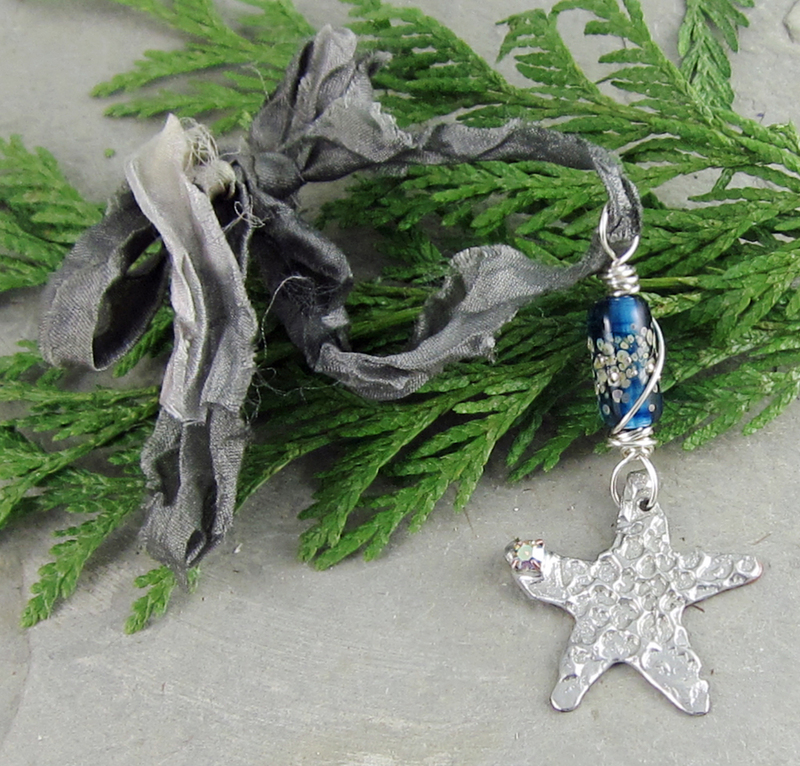 Sandi’s combination of silver star and shiny lampwork really works well…Nice job. Merry Christmas! 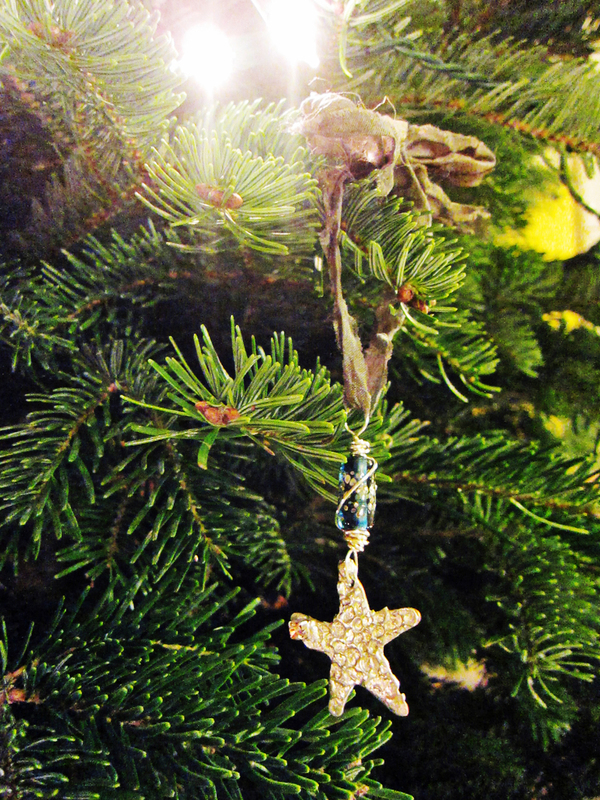 I love that little star she made with the little crystal embedded in it – awesome! I also love the pairing of the lampwork glass bead and the ribbon! What a great ornament! Wow, I love the snowflake you created for the ornament swap! Like Erin said, it has that gingerbread look to it and the color palette you used is so soft and muted and gives the feeling of a quiet Christmas at the beach!! Beautiful!!! Sandi sent you a beauty and those wonderful extras make for such a great little surprise. Merry Christmas Linda!!! Thank you so much for participating in the swap/hop!!! Oh, the ornament you received is lovely and I bet it does sparkle and shine amazingly on your tree! And what you sent to her is also so pretty. A fun swap indeed!